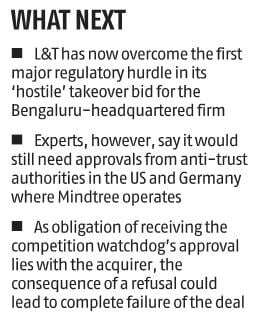 With this nod, L&T has overcome the first major regulatory hurdle in its bid for ‘hostile’ takeover of the Bengaluru-headquartered IT services firm. “CCI approves acquisition of up to 66.15 per cent of the total equity shareholding of Mindtree, on a fully diluted basis, by Larsen and Toubro,” the India’s competition watchdog announced on Twitter. 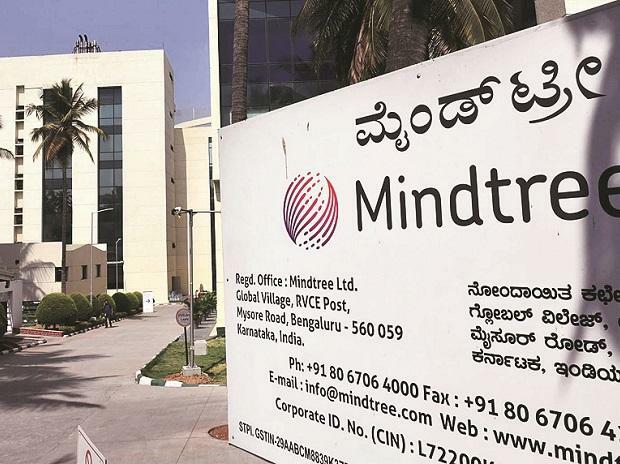 According to legal experts, though the proposed deal has been okayed by the Indian regulator, it would still require approvals from anti-trust authorities in foreign jurisdictions such as the US and Germany as Mindtree operates in those geographies. “For transactions that exceed prescribed thresholds, the approval of the CCI becomes a crucial step. Particularly, it is a key regulatory approval for the acquirer,” said Archana Tiwary, partner at J Sagar Associates. Experts also said that as obligation of receiving the competition watchdog’s approval lies with the acquirer, the consequence of a refusal could lead to complete failure of the deal. After sealing a deal to purchase V G Siddhartha’s 20.32 per cent stake in Mindtree on March 18, L&T has mounted a takeover bid on the mid-tier IT services firm by placing orders to buy a further 15 per cent stake from the open market, besides making an open offer to buy an additional 31 per cent stake at Rs 980 per share. For a controlling stake of 66 per cent in Mindtree, L&T is likely to spend around Rs 10,700 crore. The panel of four independent directors of the IT services firm is evaluating the open offer of L&T for providing reasoned recommendations to shareholders. On Tuesday, this committee appointed Khaitan and Co the legal advisor and ICICI Securities as the financial advisor for assisting it in this process. While Mindtree can give a counter offer by April 16, the committee of independent directors will give its recommendations to shareholders on L&T’s open offer by May 10. The open offer, according to L&T’s disclosures, will be between May 14 and May 27. Meanwhile, after opposing L&T’s takeover bid, founders of the company recently indicated they were open to negotiations, marking a significant change to their earlier stance. In an interview to Business Standard, Krishnakumar Natarajan, executive chairman of Mindtree, had said a ‘middle ground’ could certainly be explored through mutual discussions to protect the interests of Mindtree’s stakeholders.